In his introduction to Negative Space, Manny Farber notes the shift in movement and the break up of space within the edge of the screen in the acting of the 60’s. He argues of a time where Bogart and Hepburn moved through the frame and around it’s borders as if the world beyond was the expanse for their taking. By the 60’s John Wayne could no longer look over the skyline of the Tex-Mex border and claim it as “mine”. Farber says that “this was replaced by the kind of acting that “appears to own every inch of a small principality that extends about six inches to any side of their bodies, and anything else on the horizon is uncontrollable, unattainable, and therefore hardly concerns them”. The projected movers on the screen had become aware of their own trappings. The same air swept up painting, sculpture, and other visual arts. The gig was up on what must suddenly have appeared to be very naïve times. The end of the line art of the time (and from then on, essentially) was hip to the reality of it’s own situation and even an icon new it’s place. “Time” is a human invention – or at least our measurement of it is. It is our hardwired projection of narration on to the happenstance of being that necessitates calendars, clocks, and numbers. What is less discussed is that, similiarly, visual perception is also merely an abstract contextualization. Our framing of the visual plain creates meaning and tension that only exists in for human understanding. This is a good invention because the assessment of space within this artificial window itself invents new dynamics of experience in sight and happening. This “framing” came about as a conceptual address of reality, but it is the demonstration of this tension-creating device, in reality, that keeps it so useful. Useful that is, in the continuing form and validated effect of visual art. The space within the frame, the art itself, is now as if sentient, and like” 60’s acting” it wants, needs, and expects no more than the implied gestalt of it’s own edges. It’s not just that an image or thing exists only within it’s own content, rather, it hums with it’s own inverted perpetual motion as a necessary result of it’s insular self awareness. 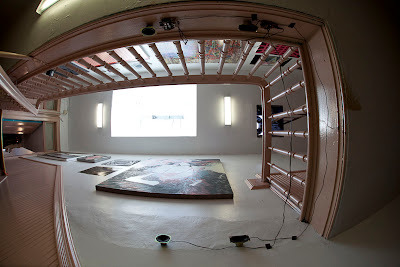 Ugly Art Room is pleased to present this practice in a suitably compact and dynamic situation. The frame that is aware of the frame. The image that imagines escape from it’s own claustrophobia within it’s own parameters. Referring to the “Landing” in the subtitle of the show is not meant to imply an installation. It is a reference to the landscape provided for the works. The top landing, the last floor, is an “almost there” area, at once implying a next step, but capitalizing on the tension of the space. 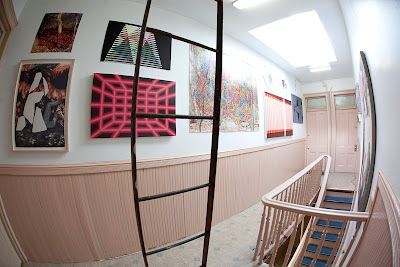 In the end this is a formal matter and the viewer is greeted, formally, by abstraction and representation alike, at the top of the stairs.